Is Apple plotting a thinner, 12-inch MacBook Air with Retina Display? The ultimate Ultrabook killer on the way? We're usually not overly keen on analyst prediction type stories, but even if this particular one turns out to be absolute cobblers, it's still a relatively interesting proposition. Ming-Chi Kuo of KGI Securities reckons Apple will launch a new MacBook model with a Retina Display in mid-2014 that'll be both thinner and lighter than the current-generation of MacBook Air laptops. The bold forecast suggests a redesigned body and a display size that sits at 12-inches, plugging the gap between the 11- and 13-inch MacBook Airs currently up for grabs. For what its worth, Kuo, who has a better record than most of the analyst fraternity, reckons Apple will 'redefine laptop computing' once again. In his projection to analysts, Kuo wrote: "We expect the unprecedented 12" model will boast both the portability of the 11" model, and productivity of the 13" model. The high resolution display will also offer the outstanding visual experience of the Retina MacBook Pro. "The offering will likely be lighter and slimmer than the existing MacBook Air to further highlight ease of portability in the cloud computing era. We think the form factor will showcase a much improved clamshell structure, and that it will redefine laptop computing once again following the milestone created by the MacBook Air." Naturally, we'd advise our dear readers to take this information with a healthy dose of scepticism, but it's certainly something to think about going forward. 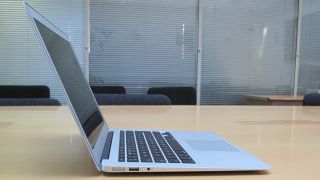 A thinner and lighter MacBook Air with a super-hi-res display? We'll have some of that. MacBook Air with Retina Display rumours have been doing the rounds for a while. Some expected it at WWDC this summer. They didn't get it.